Situated in the northern reaches of Old Delhi, the pale-yellow St. James’ Church is a historic house of worship that's still used by the local Anglican community to this day. 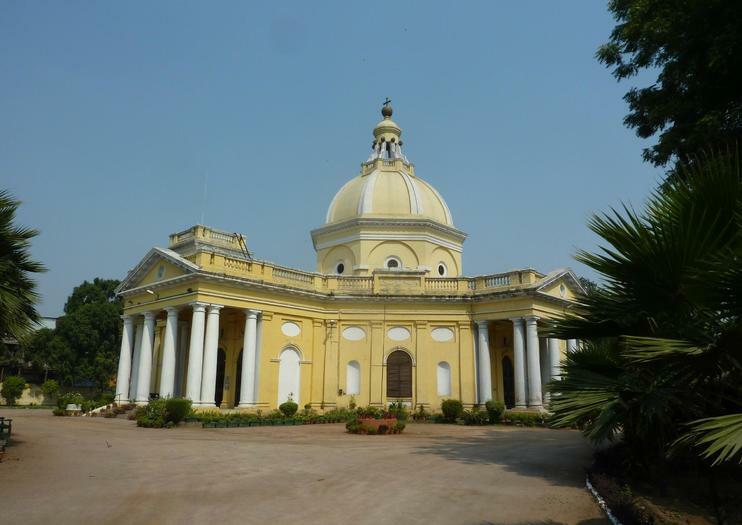 It was consecrated in 1836, making it one of the oldest churches in the city, and its adjacent cemetery contains the tombs of many important Raj-era officials. Also known as Skinner's Church after the British Colonel James Skinner, who commissioned it, St. James’ Church is an excellent example of Palladian architecture. Design elements of this pale-yellow structure include a cruciform plan, porticoed porches, and a big octagonal dome. It also contains a number of beautiful stained-glass windows brought in from Europe, plus art by Italian painter Pompeo Girolamo Batoni. While it’s not the most popular Delhi attraction, some tours focusing on Raj-era history or spirituality stop by the church. You can also arrange to visit via a private tour. Remember to dress conservatively; dresses or trousers and shirts covering the shoulders are preferable to tank tops and shorts. Services are held every Sunday at 8:30am (from Easter through September) or 9am (from October 1 through Easter). The church’s non-service opening hours vary, so it’s a good idea to call ahead or go with an organized tour. St. James’ Church is in Old Delhi, just north of Chandni Chowk. It's a 5-minute walk from Kashmiri Gate, Old Delhi's main long-distance bus depot. The Yellow, Red, and Violet lines of the Delhi Metro also stop here. For travelers coming by car, it's about a 15-minute drive to Connaught Place, New Delhi's de facto city center. The church is open throughout the year, and the interiors are relatively cool, making it a good place to visit even during the hot season. Coming on a Sunday morning for service is the best way to get the full experience. There are also services and other events throughout the year; check the church’s website for the liturgical calendar. James Skinner first decided to build St. James’ Church after lying wounded on a battlefield at Uniara, facing the potential of his death. According to legend, Skinner made a promise to God that if he survived, he would build a church. Today, Skinner's remains are interred in the church, with a gravestone just by the altar. Visit spiritual sites in the walled city of Old Delhi on a full-day tour with your own private guide. Attractions include Laxmi Narayan Temple, Gurdwara Bangla Sahib, Jama Masjid, St James Church, Akshardham Temple, and Lotus Temple. Learn about these houses of worship and the spiritual faiths that they serve, and take in the fine architecture and decor at each site. The city of Lutyens...now the political heart of Independent India.The city has influence of european style and was a symbol grandeur , power of British empire. Sir Edward Lutyen the one man brand for his innovative and adaptive architecture. The principle architectural designs has been to weave into the fabric of Indian architectural shapes and features.Take a tour around some of New Delhi’s imposing heritage buildings such as Mutiny Memorial, the Vice Chancellor’s Office at Delhi University, St. James’ Church, India Gate, Rashtrapati Bhavan, Teen Murti Bhavan and Connaught Place.